We wanted to make burgers tonight but our grill needs a new burner and we could not find our George Forman. 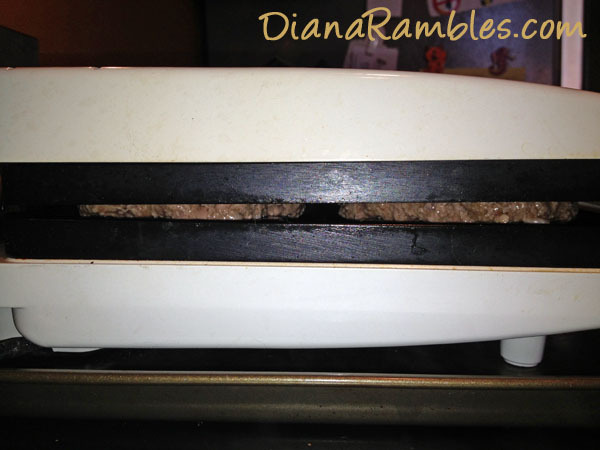 I told DH that we should use our Belgian waffle maker instead! We put the waffle maker on a cookie sheet in case the grease spilled over. Side view of them cooking. Checking to see if they are done. 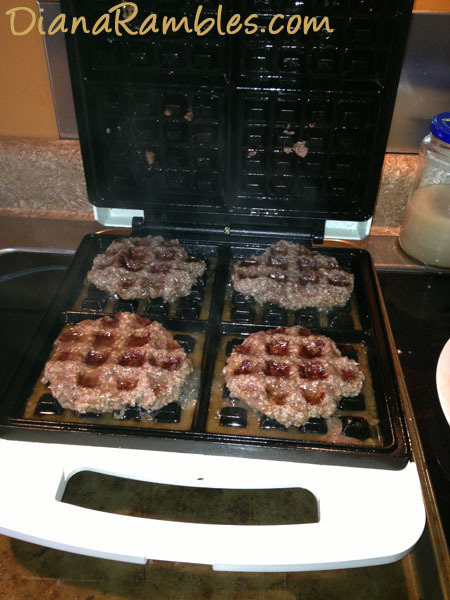 You can see how the grease pooled in the waffle iron. I used lean ground beef and recommend you do the same. Keep a close eye on it because it gets very hot! Clean up wasn’t too bad! I would totally do this again!!! Haha! Oh my heck...they look totally disgusting in the picture, but I clicked over because I think it's a GENIUS idea! I'm curious, Would you do it again, or only if you can't find your Georgy? Was the texture still good? I would totally do it again!!! I think we need to make some waffle buns first!! It was a stroke of genius. Mark it down...doesn't happen much! So funny! Way to be resourceful! Me or the burgers?? LOL! You are so creative and never cease to amaze me! What a clever and resourceful idea! I recently saw tater tots cooked in a waffle iron on Pinterest. 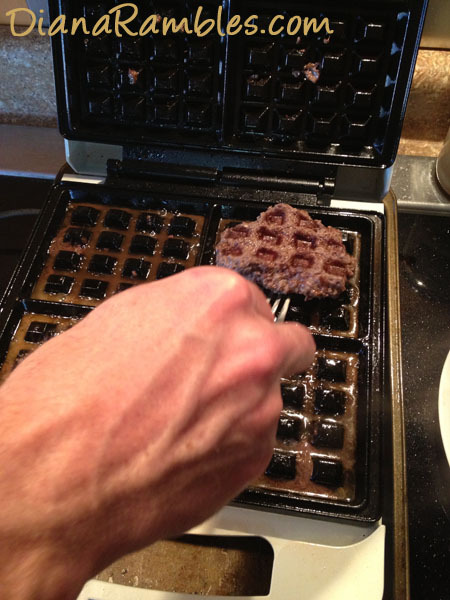 Personally, I think it is just plain wrong to use a waffle iron for anything other than waffles. I am a purist that way. How clever are you? Never would have thought of that and I don't know why. Now I have to try it. The mustard would really not slide off all over your fingers! Thanks for sharing your neat new grill, Diana! Nice! Now I don't need to wait for good weather to have burgers, thanks! I bet the kids loved this? Thank you for sharing on Fluster’s Creative Muster Party! This is a neat idea! I have definitely never had anything like this! Pretty sweet idea! Thank you for sharing at our Pinteresting Party! 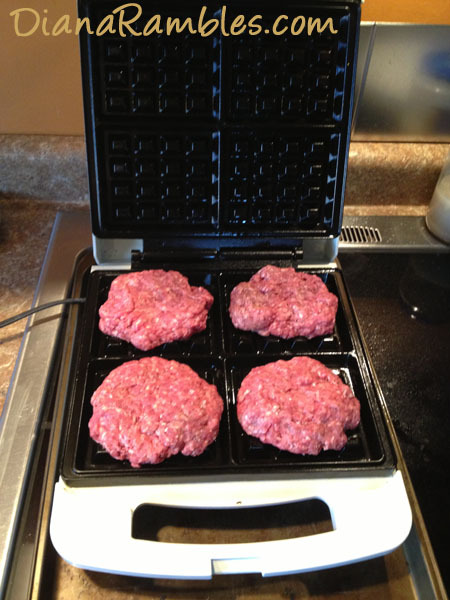 Mmmmmmm, meaty waffles! Ron Swanson (Parks & Recreation character) would approve!! I love using my waffle iron for non- waffle related creations....and great for a rainy day, when you don't want to grill under an umbrella! haha - very resourceful. Love it! HAHA! Who would of though?? Awesome idea! Great idea! 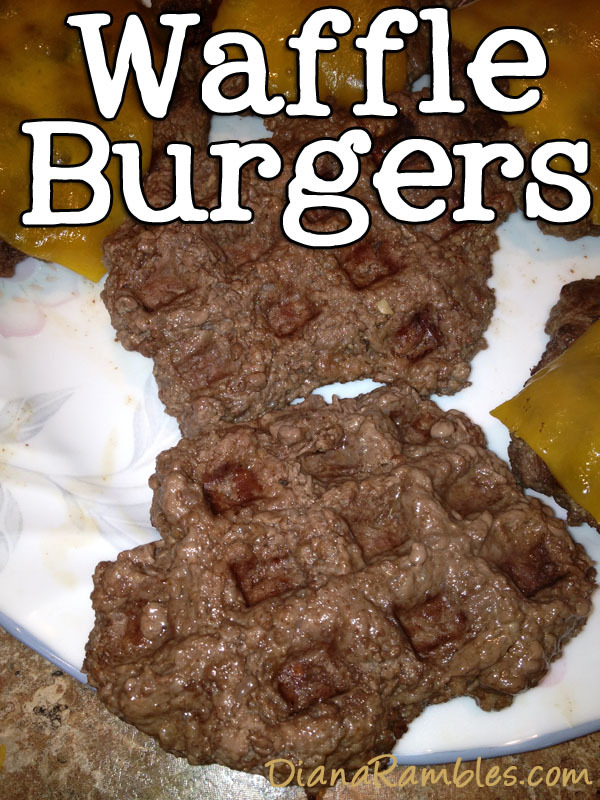 I bet the little waffle squares were perfect for keeping ketchup and mustard in the burger and not sliding out the side! haha! Stopping by from Party in Polka Dots!